What does your coffee say about you?! 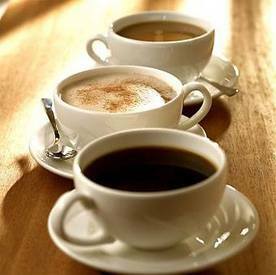 Are you a caffeine addict and enjoy the hot beverage in more than one form? Coffee comes in many sizes, tastes and forms. The distinct aroma, flavor and energizing effect of coffee makes it stand out from similar warm beverages like tea and hot chocolate. People generally drink coffee in the morning or when they’re feeling the slump to stimulate their energy levels with caffeine making it one of the most consumed drinks in the world. But, we know you can drink coffee anytime - anywhere! So- where are you on this list? Espresso - You’re friendly and adaptive. You actually like the taste of coffee, a rare but admirable trait. Double espresso – You’re practical and hard working. You like knowing that one shot just doesn’t do it for you anymore. Triple espresso – You’re enthusiastic but obsessive. You’ve been awake since the late 90s. Mocha – You’re fun loving and creative. You hate the taste of coffee but you need the pick-me-up so you improvise. Latte – You’re reflective but often indecisive. In a world of unknowns you like the safe pick. Cappuccino – You’re warm hearted but oblivious at times. Your friends have to remind you to wipe the foam off your lip. Macchiato – You’re traditional and reserved but for the most part, you hate foam moustaches. Iced coffee – You’re assertive and outspoken. You don’t let seasons dictate how you live your life. Also, you like straws. Americano – You’re calm and conscientious. You enjoy the simple things in life, like picnics in the park, birds chirping and watery coffee. Frappuccino – You’re happy and energetic. You claim to love coffee, but really, you just love ice cream. Coffee-to-go – You’re serious focused. You believe when the going gets tough, the tough get cardboard sleeves because the cup’s too hot. Espresso – You’re clever, annoying or both. You knowingly or unknowingly mispronounce espresso.